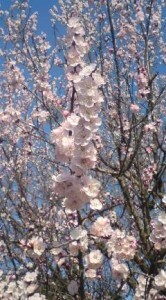 Not only are the blossoms of the anzu tree beautiful, but these trees which flower between the blooming periods of the UME (plum) and the Sakura, have had a very long history in Japan, after having been introduced to this country from its native China sometime before the Heian Period (794-1192). 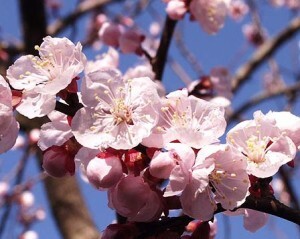 While apricots also spread to the Caucasus and the Mediteranian and remain a major fruit for consumption in those areas today, these fruits , long called KARA MOMO (peaches of the Tang, or Chinese peaches) in Japan, were originally prized for the medicinal power of their seeds (especially for respiratory problems). 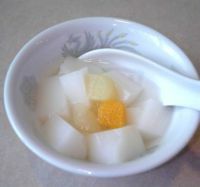 This curative was called kyo-nin 杏仁, which is now read as annin, and which has become an ingredient of the very popular desert dish annin dofu. 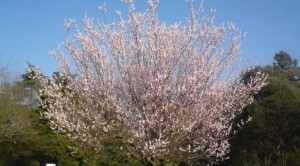 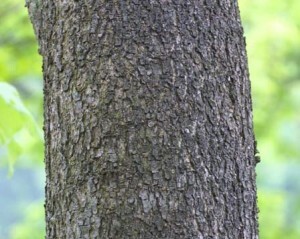 Though the earliest extant use of the word anzu for apricot was in 1620, it was not until after the Meiji Restoration, Japan`s opening up to the West and the introduction of foreign varieties that apricot trees were cultivated for consumption as fruit ( and even today apricots are mostly used for making jam and wine), and in fact anzu trees are not very common in Japan today.